I neve r retired from motor sport. I just didn’t compete in it for 16 years. It was, as several ‘resting’ F1 drivers used to say, “a sabbatical”. It turned into a far longer sabbatical than expected but on January 20th 2019 that ended. I was back behind the wheel, in competitive action, for the first time since 2003. How life has changed in the mean time! When I competed previously (1991-2003) it was before I became a family man. Most of it was before I was a home owner with a mortgage. Back in The Old Day (lets just keep calling them that for convience, shall we? ) 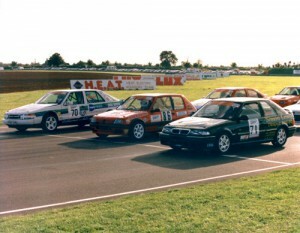 I moved around the various disciplines of motor sport : Rallying (Forest and tramac versions), sprints and hillclimbs, ciruit racing (RIGHT: thats me closest to the camera at Castle Combe in 1996) autograss racing and even a sand race meeting in the Channel Islands. But by 2003 with the divorce looming, the race car still in componant form following it’s last encounter with the barriers and my mechanic (my younger brother Ashley) moving first to Wales, then Australia, I had neither the cash nor the technical help needed to carry on and it just seemed logical to take the sabbatical. 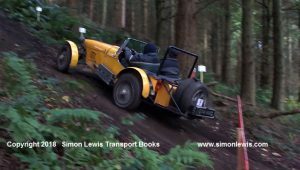 One discipline I had never tried, was classic trialing – as in the proper, traditional style of car trial that has run in Britain from the very early days of the motor car: The Lands End, The Exeter. 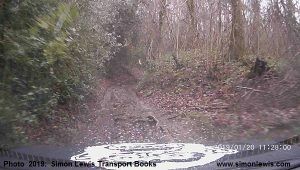 The sort of event where you negotiate a prescribed route within a time frame and via numerous ‘observed sections’ on steep slippery rutted hills and farm tracks in which the aim is to get to the top (or as close as possible) without grinding to a halt in a cloud of tyre smoke or a shower of mud. 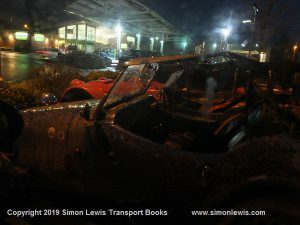 As you can see by earlier posts in this blog, I have become quite enamoured of such events in recent years as regular spectator in VINTAGE SPORTS CAR CLUB trials. But these were all for pre-war cars. Great to watch but out of my league to compete in as you really need to know how to prepare such aged machinery, or have the capacity to pay someone who does! 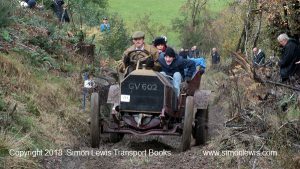 I’ve taken my two girls , Charlotte and Georgie, along to numerous VSCC Trials and they love the muddy, madcap nature of these events. 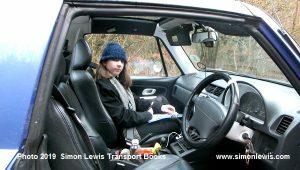 Charlotte in particular was so struck by the sight of children similar in age to herself acting as passengers and ‘bouncers’ in the back seats of several cars that she inquired of an official as to what age she needed to be. The answer was “Twelve” and she was eleven at the time. 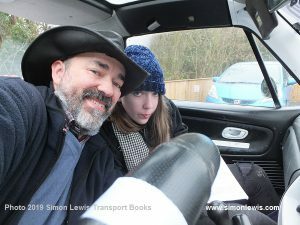 On the way home she said “Dad… Can you buy a vintage car so we can do trials when I’m twelve?” Now that’s the sort of thing any petrol-head wants to hear from his offspring! 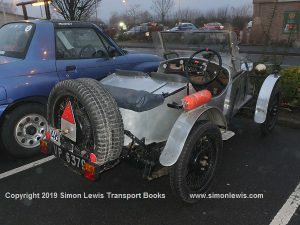 But it still left the problem of not being able to afford or run even a humble Austin 7. But it got the mind whirring. 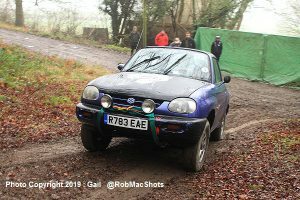 Then I got talking to Stuart Palmer whom I competed against back in The Old Days and like me he came from a rallying background and we’d moved into circuit racing in the same series at the same time. 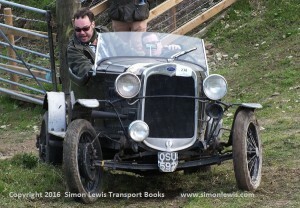 Stuart had also children of a smilar age to mine and was now trialing an Austin 7 . But he pointed out that non-VSCC trials were plentiful and a wide range of cars could be used with inexpensive modifications. I found out one such event, The Kyrle Trial (above left) , was running within a few miles of home so I went to take a proper look and that dormant urge in my soul to compete not only woke up, it did a veritable clog-dance to ensure I was aware of it’s presence. The next bit is all your fault Stuart. With that gentle shove in the right direction I had a sudden plan and asked Charlotte if she would be OK about the car not actually being vintage? It turned out to be a non-issue. Any car would be fine so long as she got to be my passenger. Fast forward to January 20th. 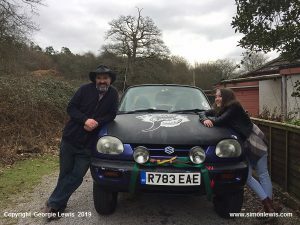 Me and my girl are outside The Squirrell pub near Ludlow sat in a Suzuki X90, fully kitted out and fresh from gaining a bronze medal on the Exeter Trial a few weeks before with it’s preious owners Rory and Ian Fitzgerald. We’ve signed on, got our numbers taped in the windows and Charlotte has the ‘route card’ on her lap . We’re waved forward by a friendly start marshall and at 09;28 sent on our way. Blimey…this is it ! The M.A.C. CLEE HILLS TRIAL. After 16 long years I’m competing again and with my 12 year old daughter now in charge of telling me which way to go, when to stop and , as it turned out, of getting out and opening (and closing) a great many gates over the course of the next 7 1/2 hours. We do our best on the next two ‘Sections’ too, and don’t get very far on either but by then I had been advised by a fellow X90 driver to “Let those tyres down – RIGHT down!” Conditions call for ridiculously low tyre pressures (6psi) and we have a faulty tyre guage so it’s either a matter of guess work or borrowing someone elses. It seems everyone is only too happy to help. Advice is freely offered and tools loaned. Later in the event our boot lock breaks, while shut. All the tools and tyre pump are trapped inside and yet we get offered help. 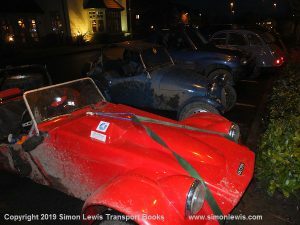 Stephen Kingstone (following behind us in his effective MG Midget) loans us a screwdriver, Nick Deacon and Kevin Sharp, fellow X90 runners, offer to wait at the end of the following section and reinflate our tyres for the follwing road section using their compressor. Luckily the boot lid flies open of it’s own accord over a bump on that section and so they help us dismantle the mechanism so the boot can be lashed shut with a length of rope. This suffices for the rest of the event. A lot of time on these trials is taken up in deflating or reinflating tyres from near flat (for the slipperiest hills) to nearer 30psi for the public road sections. In the days before electric compressors, this must have made trialling a fairly physical sport. Putting 30psi into two large section tyres with a foot pump would take a lot of effort. This is a long, steep bridal way through a wood, between rock walls on a surface that suddenly tips the car 30 degrees to one side and back the other, before throwing the front wheels up into the air over a fierce bump and we almost come to a halt while I’m grabbing a lower gear…but not quite. Forward movement is maintained and we ‘clean’ the hill, penalty free. The joyous moment is captured , deafeningly, on the in-car video. We are just a bit pleased at this, as you can tell when you watch it. The next two sections also go well and we are now up on top of the Long Mynd , a 1500 foot hill (mountain?) on the Welsh border with a little snow here and there and a blanket of mist which prevents us enjoying what must be spectacular views on a clear day. Odd little breaks in the cloud give us a hint and having passed through the gliding club’s landing ground we are down into Priors Holt wood for the final three sections. My navigator is really enjoying herself, with the excpetion of the gate opening-and-closing routine . The car is warm and dry, the people we meet are all friendly and laid back. No one is being a ‘jobsworth’ and it’s all turning into one of the most enjoyable motor sport events I have ever done. 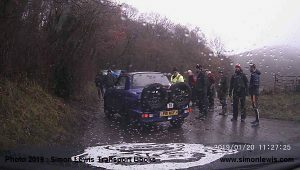 Then we get stuck on the penultimate section and have to be towed out “Don’t worry” says the marshall , pointing at the chap fixing a tow rope from our car to his Land Rover “He’s done this 34 times so far today!” So even that ignominy was just something else to laugh about. We laugh a lot during the day, enjoying our novice mistakes in a way I would never have done in The Old Days. The final section was causing a few delays so we ended up, where we started off, in a queue behind anther X90 (LEFT). 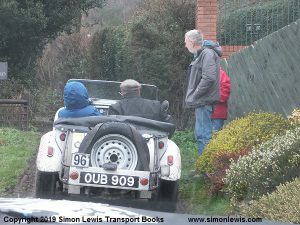 This one was crewed by VSCC regulars Jon and Nimmy Mellor who normally run an Austin 7 but had just bought a Suzuki as they wanted to try tougher events without wrecking their 88 year old ‘Seven’. We compared notes and scores and seemed to be getting along about the same. Charlotte and I did OK on this final section but the long, long, long,slow, steep reverse back down the hill accounted for our only real bit of battle-damage when a small roadside tree just would not get out of the way and removed a door-mirror at a speed of about 1mph… in reverse. 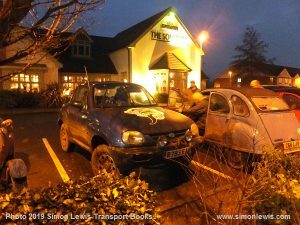 And that was it, aside from running back along the A49 to the Squirrell pub and signing off. Well the next one, that we have entered, is “The Land’s End” at easter, a rather longer affair which includes night sections and a much longer road route . It’s an event that was first held long before the first world war and many of the ‘sections’ used have been a feature on the route since the 1920s and 1930s. It has some real history to it and we can’t wait! 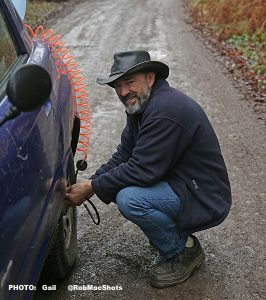 Footnote:Many thanks to “Mr and Mrs Camera”, Gail and Rob of @RobMacShots (check it out on Twitter) for the photos of us in action and inflating the tyres. Great to see you both at the start and on the Jenny Wind section. Charlotte looking serious before the last section. 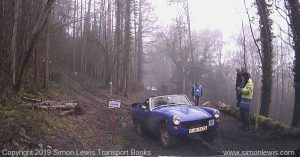 MG Midget (Stephen Kingstone/Kerry Greenland) heads off to the Ippikins Rock section. Well done but bigger pictures, please! 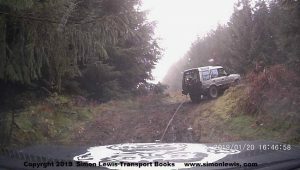 Are you doing the Northern Trial on 23rd Feb? Great to read your blog Simon. 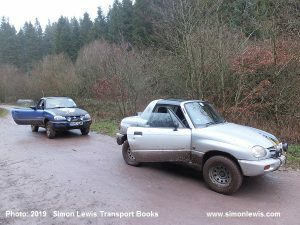 Never competed in trials as such but have done some “off roading” in 4×4’s, up near Merthyr where my biggest shock was driving into a stream and a wave came and hit the windscreen, bit of a shock. Then up at Eastnor Castle and also the off road course at Silverstone where I won a trophy and was presented it by none other than Stirling Moss and he took me around the circuit in a 911, what a man to drive with. This was back in 2005 and the trophy and the photo of him presenting it to me stands proudly in my hallway now. I also made fastest time of day in the slalom that day. 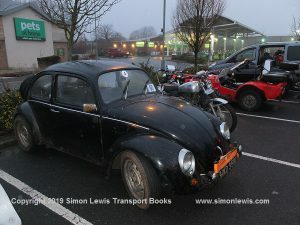 As regards trials, a friend takes part in them sometimes, he has done the Exeter a few times in his Beetle. If you see him anytime say “Hi”, his name is Paul Dickenson. you mentioning lowering tyre pressures always reminds me of a trail in California where they only allow jeeps and they air down to 2psi over the rocks. My wife Cilla and I were in Colorado a few years ago and a town north of Durango named Ouray is known as the jeep capital of the world with all the mountains around there, must admit that if I lived there I would have a jeep and some fun. Best wishes for the future to you and Charlotte. Thats very kind of you Trevor. Eastnor Castle is not far from here – but only been there to a music event! I did a bit of 4×4 stuff back when my brother had a garage based on a farm, we spent many an hour down in the fields and on an overgrown disused railway embankment which actually led to the long demolished Severan Railway Bridge. Lots of fun. I’ll keep an eye out for Paul Dickenson, he might be on the Lands End at easter. Cheers.